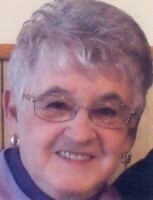 Sheldon – Mary Jane “Chickie” (Taft) White a lifelong resident of this area passed away unexpectedly, Sunday July 2nd, 2017, at the UVM Medical Center, surrounded by her loving family. Born in St. Albans on March 12th, 1935, she was the daughter of the late Eugene and Orena (Fleury) Sequin. Chickie was 82 years old. She was first married to Henry E. Taft, who pre-deceased her on June 2nd, 1987 and then on July 4th, 1990, she married Joseph K. White, who survives her. Chickie was a 1954 graduate of Bellows Free Academy and was a longtime associate with Bertek and then Mylan. For many years she was also associated with Tom’s Lounge on the corner of Federal and Kingman Streets. She enjoyed listening to country music, was an avid Yankee’s fan and Chickie was an accomplished pool player. Chickie is survived by her husband of 26 years, Joe, of Sheldon; her sons, Michael Taft and his wife, Therese, of Hoosick Falls, New York, James Taft of St. Albans and Thomas Taft and his wife, Lorna, of Franklin and her grandchildren, Brandon, Aisling, Devin, Chelsey Gagne and her husband, Eric, and Natalie, as well as her great-grandchild, Emrey Gagne. She is also survived by her step-children, Chris White and his wife, Darcie, Amy Payne and her husband, Michael, and Angel and Gopichand Vallabhaneni and step-grandchildren, Shane and his son, Avery, Graham, Phoebe, Marissa, Choudari, Mohini and Roma and a special friend, Lise Dexter. In addition to her parents and her husband, Henry, Chickie was preceded in death by her brothers, William, Albert, James, Harold, Eugene Sequin and her sisters, Sister Margaret Mary Sequin and more recently, Anna Sequin Lanoue on January 18th, 2017. A Mass of Christian Burial for both Chickie and Anna Lanoue will be celebrated on Tuesday, July 11th, 2017, at 10:00 A.M. at Holy Angels Catholic Church, 245 Lake Street, St. Albans. Interment for Chickie will be at a later date at the Taft family lot in the Village Cemetery in Hinesburg. Those planning an expression of sympathy are asked to consider the Franklin County Animal Rescue, 30 Sunset Meadow, St. Albans, Vermont 05478. Assisting Chickie’s family is the Heald Funeral Home, where her on-line guest book is available at www.healdfuneralhome.com.